Poetry is an important art form, and part of that import is in the inherent subjectivity of the genre. What you take away from a given poem will absolutely be different than what I take away from it. And isn't that marvelous? A single stream of thought on the page, an observation, a proverb, a magic trick, can evoke countless reader reactions. Before a poem can be written or a story can be told, the teller holds her story in the palm of her hand. It sparkles like a cut diamond. When held up to the light and spun, the story's flat, pure faces cast a rainbow of reflections against the far wall. These are the many versions of that story, the vantage points on a single event or series of events. The question for the teller is how she can and should enter that story. And write it down to share. That same question exists for the reader, too, even after a story is told one way. It is the reader's prerogative to take it from the black velvet cushion of the gift box and raise it once again to the light. To spin it. To read the flashings and points of colored light on the wall the way one might read tea leaves or the shallow, pink creases in the palm of a hand. This is what makes some stories (the best stories) timeless. Mythology lingers because each generation reads with new eyes, with the benefit of an even longer history. When I was in sixth grade and learning the Greek myths for the first time, I fell in love with the tale of Persephone. It is a story that was first told hundreds of years B.C. As an American 12-year-old in 1995, my vantage point on the story was immature, but passionate. If you'd asked me then, I would have said it was the tale of a daughter taken from her mother. That isn't the way I look at it now. "The only legend I have ever loved is the story of a daughter lost in hell. And found and rescued there." Eavand Boland's poem The Pomegranate begins this way. It has been a favorite of mine for many years because it accomplishes something important. 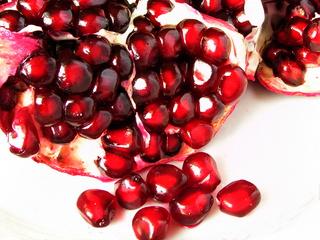 When I read The Pomegranate , I am offered something as poignant and timeless as the legend it describes. I am offered an evolution of perspective. Over the course of the poem, Boland describes her vantage point on the Persephone myth. Time passes. Boland's position in the world changes from daughter to mother. If you were to ask me to explain what makes a poem a good poem, I would point to this one. It is lyrical; it is elevated. It speaks truth; the story it tells is timeless. You may not remember this poem when you are ninety, but I probably will (if I am fortunate enough to escape the heavy, gray veil of Alzheimer's which dangles dangerously over my family tree). Why? Because it will always speak of at least one of the roles I play in life. It will follow me. The sun will arc through the sky over my head; my shadow will shorten and pool beneath my feet and stretch out again in a new direction, but all the time it will touch me. Which is what good poetry can do. P.S. This isn't the first time I've been inspired to write about this wonderful poem.